You’ve never had a Sazerac Cocktail (in the same way that you have probably never had a Pappy Van Winkle Cocktail). Unless you have about $17,000 to buy some Cognac Sazerac, all that is left of the Sazerac Cocktail is prologue and epilogue. You might have had something even older than the Sazerac Cocktail. 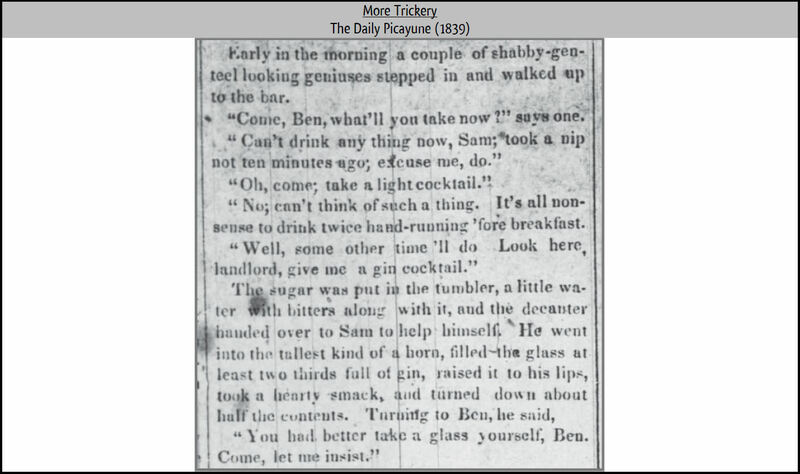 On Wednesday morning, the first day of February, 1843, a cocktail was described in the New Orleans newspaper, The Daily Picayune — quoted or paraphrased from another publication, the Sunday Mercury (perhaps from their edition of Sunday, January the twenty-ninth). Note that the mention of (surely dry) sugar is evidence that this cocktail was made the old-fashioned way — as would be expected at that date. 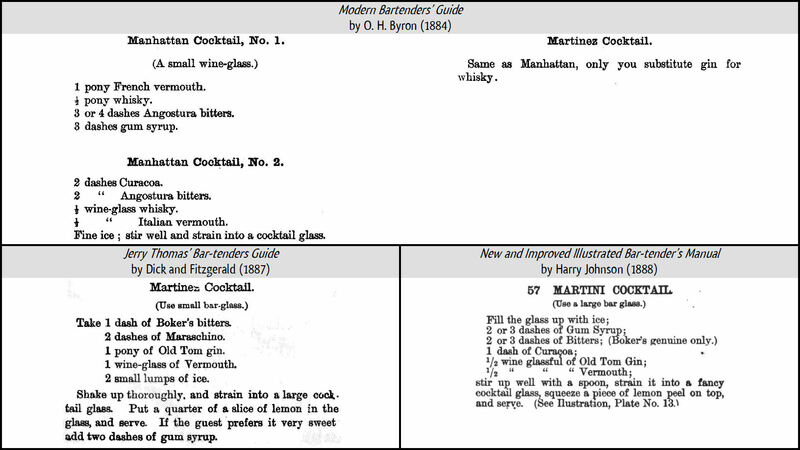 Thirty or forty years later, many American bar-tenders might call the drink an Improved Brandy Cocktail if made the modern way using sugar syrup and stirring though ice before straining (requiring more pure water and ice than was affordable before the industrial revolution). 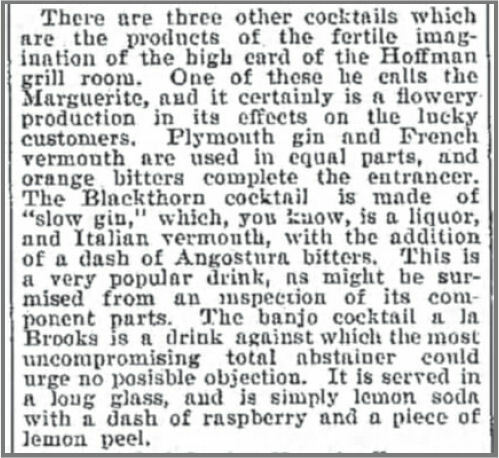 Notice that when the Sazerac (and Zazarack) Cocktail began to show up in print, it was by no means always made with Peychaud’s bitters. That assumption might have been even later. That’s alright, I make the same assumption. 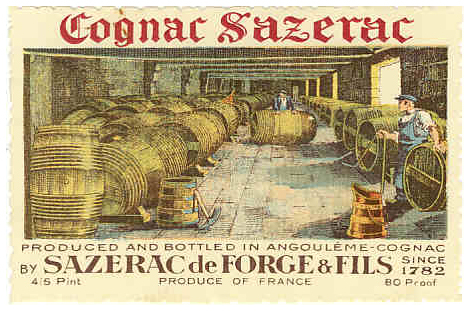 Cognac Sazerac was a preferred trademark of Cognac brandy that became unavailable in the first half of the twentieth century. It should not be confused with being any product from the modern, opportunistically named, Sazerac Company. As early as Cognac Sazerac can be shown to have been available in New Orleans, it can be assumed to have been used in the Queue de Chanticleer Cocktail at least occasionally – which, as stated earlier, would make it indistinguishable from the later Sazerac Cocktail. As can be seen from the advertisement above, Sazerac brandy was already available in New Orleans when the Queue de Chanticleer Cocktail was first described there. 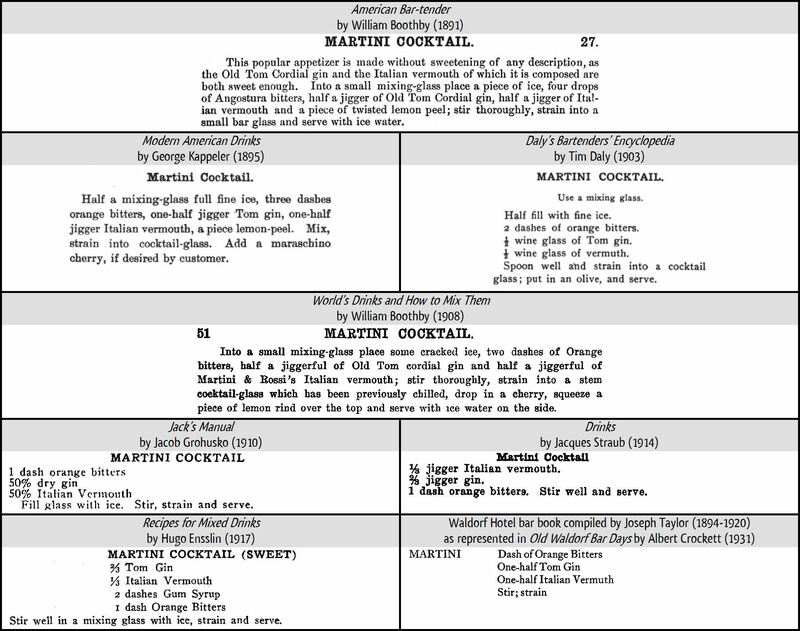 The name Sazerac Cocktail is documented from 1901 onward. 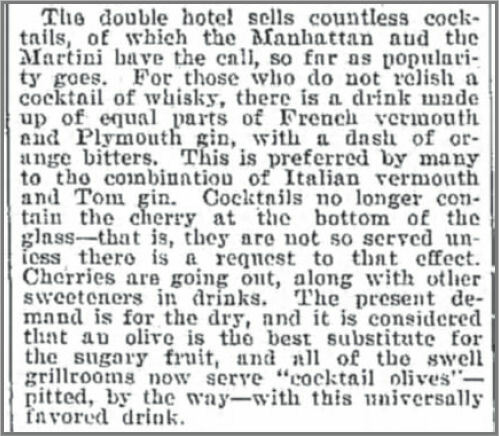 That means that the drink was renamed for the trademarked liquor in it some time between ~1843 and 1901. I believe that the name came late, closer to 1901. Otherwise, the omission of the drink in so many sources that should have known it becomes difficult to explain. That is especially true of Lafcadio Hearns’ 1885 book, La Cuisine Creole, in which recipes for the favorite drinks local to New Orleans are given by the author who lived there for years – but without so much as a mention of anything called ‘Sazerac’ (nor anything called ‘Ramos,’ for that matter). But, what of that other drink that is similar, but based on whiskey instead of brandy? Imagine it — confusion where there is alcohol! So, there you have it. 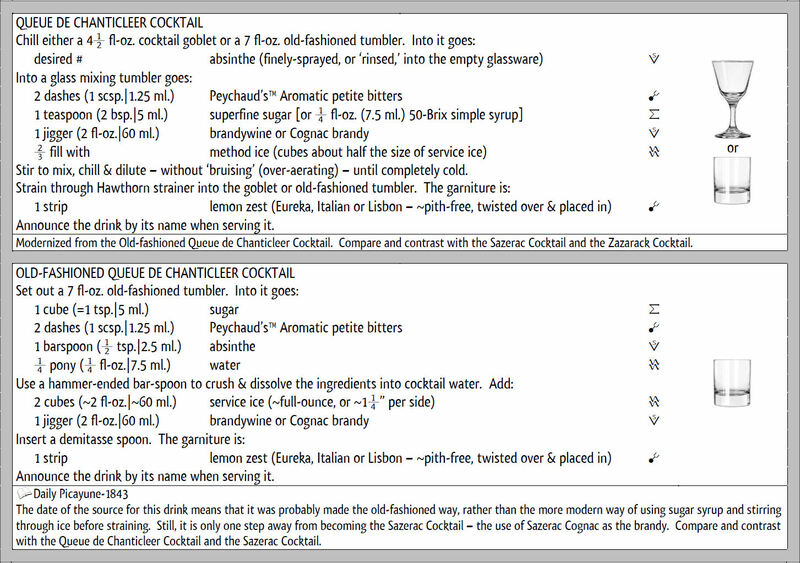 The brandy-based Queue de Chanticler Cocktail became the Sazerac Cocktail when made with Cognac Sazerac as the brandy, and then the Sazerac Cocktail became the Zazarack Cocktail (or Zazerac Cocktail) when based on whiskey. The only one of these that can not be had today is the actual Sazerac Cocktail — because Cognac Sazerac exists no more. I know that a Sazerac rye whiskey has existed for a little while — but that is shameful, or historically ignorant, labeling. 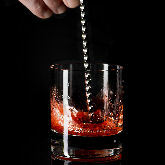 I happen to prefer the Zazarack Cocktail over the others, anyway – but that is a subjective matter. Today’s drink of the day is the Southgate Cocktail. It comes from the book recipes compiled by Joseph Taylor while working at the Waldorf Hotel bar between 1894 and 1920. Taylor’s collection of recipes was later published by A. S. Crockett. 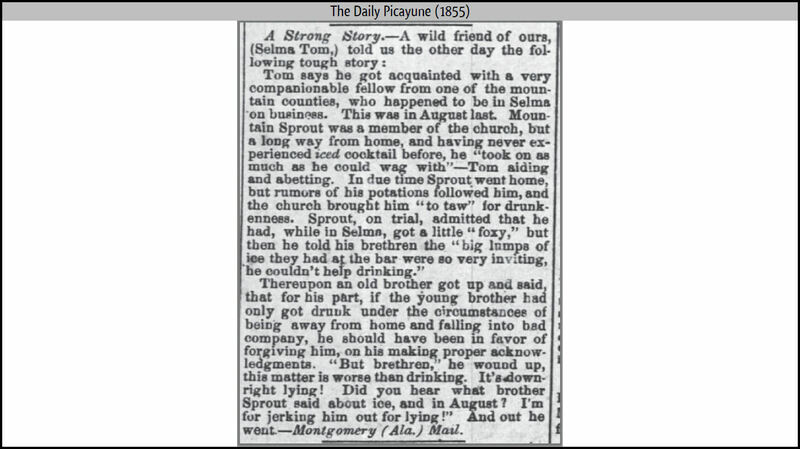 If we can assume that the drink was named after some notable person in the area of New York City before 1920, we can wonder if that person was Harry Southgate (who famously filed suit against a dinner guest once for “alienation of the affections” of his wife), or if it might have been Helen Southgate (who seems to have either; shot and killed Henry Grosvenor Barbour and then shot herself less-fatally, or was shot and wounded by him before he fatally shot himself). Perhaps it was named after the Southgate family in a serialized tale of fiction that was appearing in newspapers at the time. The Southgate Cocktail is nothing more than an Old-fashioned Whiskey Cocktail with Boonekamp as the bitters. The drink is tasty, and reason enough to go get some Kuemmerling or Underberg Boonekamp bitters. 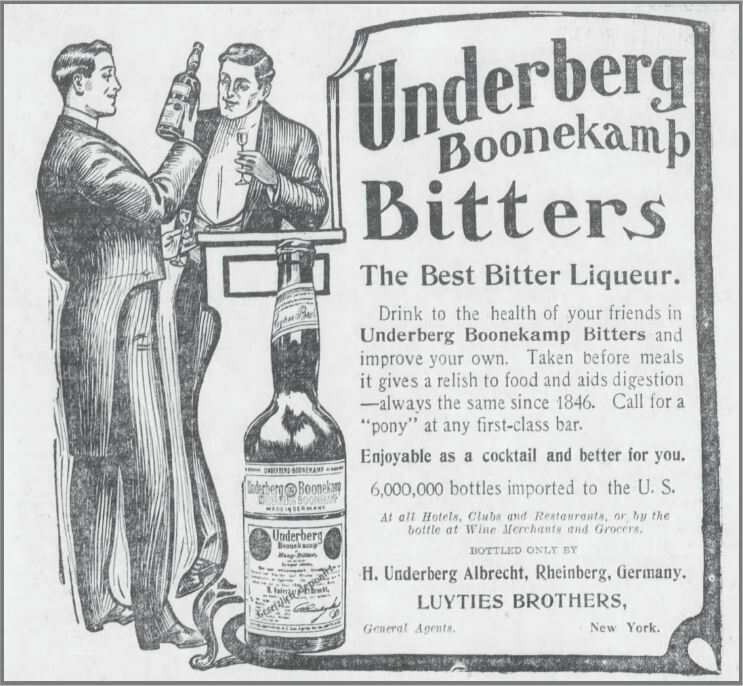 Note: both Kuemmerling and Underberg long ago dropped the word ‘Boonekamp’ from their labels, but both are still Boonekamp bitters — in fact the world leaders for the type. Click on the recipe image below to enlarge it. So, you want to make an authentic Rock and Rye, or a Rock and Rum, or a Rock and Rack? Maybe you want to make some Tiki drink with a more traditional version of a certain syrup than was available when the drink was first created in the middle of the 20th century. Either way, you will need genuine rock candy syrup. Bring one part (by volume) distilled water to a temperature as close as possible to, but not higher than, 112º Fahrenheit. An induction cook-top (like this one ) that can be set at exactly 110º Fahrenheit could be really useful. Add three parts (by volume) pure, refined sugar (sucrose). Stir over the same heat (never exceeding it!) until the sugar is dissolved. It may take some time. Pour the syrup into mason jars. If you want to harvest the rock candy instead of discarding it (stuck to the inside of the jar), suspend a string in the mason jar to which the rock candy will form. Once no more rock candy forms inside the syrup, pour it from the mason jar into a syrup bottle. This syrup will contain the highest possible amount of sugar in a stable solution. 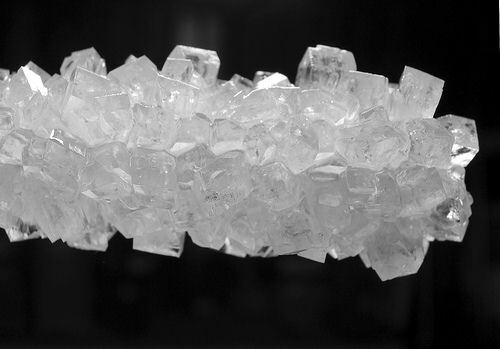 It will be the closest thing to genuine and traditional rock candy syrup that you will have ever had.